Our Madrid Spc vertical blinds come in Five shades and is very popular in sunrooms and living areas. 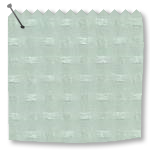 With a small sqaure running through the material it is available in a matching roller and roman blind. The material has a Uv rating of 100 meaning the fabric will have excellent heat and light protection. If you have a special request or unusual size please contact the factory directly as we can accommodate most requests. Finish: Blinds are finished with white stabilising chain which is already connected and ready for hanging. Control Chain: Our vertical blinds all come with metal operating chain, we don’t use plastic as it stretches and discolours. All louvre blinds are cut on a automatic machine providing accurately cut and punched verticals with slots all the exact same length. Top and bottom pockets are stitched and not glued. We manufacture all are own vertical blinds ensuring consistent quality and very competitive pricing.